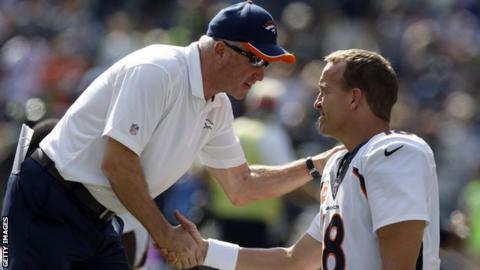 Denver Broncos have parted company with head coach John Fox following the side's season-ending play-off defeat by the Indianapolis Colts. Fox took over in 2011 and led Denver to four AFC West division titles. He also guided them to the Super Bowl last year but they were comprehensively beaten by Seattle Seahawks. Fox held a meeting with general manager John Elway and said: "John and I mutually agreed that the timing was right for this decision."